I barely knew my Opa; he led a lonely, stubborn life on his farm in the Black Forest, two hours from Freiburg. It was a ridiculous idea. But there I was, on a June evening, watching Opa’s twilight silhouette drop its hoe in the garden patch and hustling over to involve me in a skeletal hug. “Mein Liebling,” he said. “Willkommen zum Wichthof!” Wichthof was what he called the farm. Inside his cottage, we ate pickles in a kitchen that smelled of pickles. His English was poor and in his throat was an excess of phlegm; it necessitated sharp stops among many consonants, to the effect that his sentences seemed less spoken than whip-tamed. Opa, I learned, was a folklorist. He showed me his study that first night, and that first night only; after that, he kept it locked. I did not understand what his project was, exactly. He seemed to be gathering local folktales, and I remember him saying something about “correcting the great mistake of the Brothers Grimm.” I took a look at the notes on his desk, notes to some essay he was writing, but I did not linger; I did not know I ought to be interested. The essay will argue that the uncollected folktales of Southern Baden-Württemberg give evidence of a folk-entity distinct from the Fairy of the Irish-English tradition. In the latter, one finds stories of a trivial nature: farmers finding swine tied together by their tails, country folk waking up two hours before dawn, deceived by what sounds like a rooster. This new folk-entity, however, gives us tales of entirely different sort. I was, I should explain, an avid sketcher. I had begun when I was eight, because of my little sister: she hadn’t been born yet and I wanted the first go at her. I spent countless pages getting her eyelashes right, her smile, her bangs—all very pretty of course, prettier even than I thought I was. Then for obscure medical reasons, my mother decided to have an abortion and I never met my little sister. But the passion lived on. By the time I was fourteen I was declining sleepovers so I might have more time to make pencil studies of the felled oaks in the field behind our house. I read how if one was discerning, one could see a tremendous activity in motionless things; so I tried to become “discerning.” I even started preparing to enter a young artists’ competition with a big art magazine called Phenomena. My future, I was convinced, depended on winning. Thus it had been with a vast, seething annoyance that I had received the news I would be living on my Opa’s farm, far from paint supplies and galleries. The first morning, before the summer sun had heaved itself like a somnolent cat into squatting position over the property, Opa woke me. The lives of three goats, three sheep, and a dozen chickens depended on us, I was told, not to mention the hundred cabbages in the patch behind the house. All chores were done swiftly as possible, so that noontime borscht could be slurped and Opa could get to his more important work in the study. There were other expectations for me. “I give you the old Gartenanlage. Is by duck pond,” he said, presumably in a gesture of hospitality—for the man could not imagine, the way he zipped pixy-like around his own garden and kitchen, that hands might like to go idle. The Gartenanlage (garden plot) was a great distance from the house, and when I finally found it I wondered why he had called it a duck pond. There wasn’t a single duck to grace it with a quack. For three afternoons I worked dully in the plot, finding none of the gardener’s satisfaction in the thwunk of a weed’s taproot releasing from the soil. Eventually, though, I realized that Opa’s mind was truly in his study and he would not be monitoring my progress. I stopped my weeding. To keep up appearances I would trudge out to the duck pond, carrying my spade and my sketchbook, only to leave the first of these entirely unused. I never planted a thing. (1) Appearance. In this regard, the folk-entity described by the Grimm stories diverges distinctly from that of Southern Baden-Württemberg. In the former we find diminutive, hominoid and (in one tale) naked entities. In the latter are beings lit from within and as tall as young trees, who appear and disappear on mountain slopes and lake shores. Not uncommonly they are accompanied by servants, often bizarre creatures who serve blindly and know little of the minds of their masters. There is a place at the edge of every forest where the daylight grows shy; I sat in that garden for hours, trying to get it right. I couldn’t. I squatted there, working myself into a fit of self-loathing, until finally—and this demonstrates the extent of my passion, since I was a gentle girl—I threw down my book, stabbed my pencil hilt-deep into the soil and stalked off, leaving them there. When the rain came, I was peeling potatoes with Opa in the kitchen. I did not notice right away, not until Opa used an old German expression (Es regnet Bindfäden, it’s raining strings), and in trying to puzzle out its meaning I also puzzled out the fact. I was out the door before I could drop the peeler. Of course it was too late, but the real blow was that, instead of finding my sketchbook soaked, I couldn’t find it at all. I looked until my teeth were chattering, but the wind, like a fussy cleaning lady, had moved it somewhere. It had even taken my pencil. I was devastated. Four months’ worth of studies were in that sketchbook, each of which I’d been sure could win the contest, each of which contained the seed of a whole future of fame and recognition. I catastrophized, lost sleep, tore apart my fingernails. It took me three days to hold my head up again, to improvise a sketchbook out of scrap papers, to return to the garden plot. The path bent along a copse of poplars which blocked the duck pond from the house, and when I had come to the point in the curve at which my plot became visible, I dropped into a crouch. I’ve said that I did not plant a thing. Well, in the center of my weeded garden bed stood a sapling. And beside that sapling was a creature I knew at once was not supposed to exist. It is very hard not to make something like this sound silly. Maybe it will help if I clarify that this was not one of those mythical creatures, like a gryphon or a unicorn. This was something else. I was so moved by its strangeness that when I was done staring the old habit took over, the habit that governed my response to the beautiful, the weird, the sublime: I took out my pencil and began to sketch. I still have that drawing among my old work in the attic. If I retrieved it now it would show something like a snake with friendly eyes that had been given a gift of limbs and a thin coat of golden fur. It would show the creature standing about as high as my knees; it would show a tail as long as its body. I do not, however, think it would show the sense of immense patience it exuded. The creature moved so little that its eyes contained the entirety of its activity, and the way it looked around hopefully now and then reminded me of a loyal dog abandoned by its master. (2) The Name. In the forests around the Schreckensee, people know them as the “Randmenschen” (edge-people), and a Berliner who spent his childhood on a farm two hours from Munich calls them the “geschichtslose Völker” (folk without history). The Grimm brothers call them the “Wichtelmänner.” I could use any of these, but I prefer the name my own grandmother used: the Wichteln. The next few days had me spying on the creature at every spare moment. He did not make an entertaining spectacle, to be sure, for I saw him do nothing other than stand, sit, pace, yawn, and make threatening gestures at incoming birds. But the monotony itself was intriguing, and soon his simple, unflagging diligence began to impress me. Sipping Opa’s borscht, I would think: even now he must be standing there, keeping watch. And in bed: even now he’s by the duck pond, shivering. Very soon I was pondering how to make my approach. I was almost sure he did not pose me any threat; I had seen him fall clumsily from the sapling in an attempt to shoo away one of the warblers that came to perch. Moreover, he seemed to grow thinner and more sluggish each day, and his eyes to grow glassy and resigned. Could I bring him a blanket? I wondered. Would he eat sauerkraut? Finally, it was another night of rain that decided things. There is something exciting about rain in the country; it turns the land into a great drum-roll, announcing something that never comes. It gave me a jittering kind of courage, and I snuck out the back door with an umbrella and one of Opa’s spares. The creature did not hear me right away. He was slumped miserably against the sapling, flicking his tail listlessly, utterly soaked. I was filled with pity, and, clearing my throat, stepped forward. Immediately he was on all fours. Eert eth ave ton yam ou. What surprised me more than that he could speak was that his voice did not come from his throat. It was an organization of wind and rain and any element it could make use of, which my mind somehow knew how to read. It took me a moment to respond. He looked questioningly at me a moment, then abruptly shook himself. Ah, that’s right. Even speech is forward here. He appeared chagrined. I said, You may not have the tree. Then I will do you no harm. But, hastening to correct himself, added, I will do you no good either. He seemed intensely curious and ticked his tail against the sapling. Are there really no others? I don’t know how to choose. I missed the helplessness in his voice. “Then you must be bad,” I said lightly. He hung his head. Well, if I must be. He was, I learned then, a creature of extreme humility, and immediately I was sorry. “Let’s start over.” I moved closer. “I’m Lizzie. I brought you an umbrella, to keep you dry. Here.” I opened it and set it on the grounded next to him. He let out his tongue into the dry air beneath the umbrella; then, rather clumsily, he seized the handle with his tail and held it above himself. I am certain that at this moment he smiled. He said no more, but looked about wonderingly, watching the rain fall everywhere but on himself. He seemed to forget about me for a while, and because this time the silence was not the awkward sort, I also said nothing. Eventually the moment became a plurality of moments, and I remembered what patience the creature possessed and began to grow impatient myself. “It’ll take a few minutes,” I said, and ran back to the house. (3) Time. The Wichteln have an atypical experience of temporality. This trait, at least, squares with the entities we find in the Grimm brothers’ stories—one tale of which describes a servant girl who is invited to hold a child for the Wichtel at a christening. She only spends three days away, but when she returns to her master’s house she is accosted by strangers—for she has, in fact, been gone seven years. There are also stories of stolen babies who return again the next day, older than their parents. It was an easy friendship. He had, it seemed, been sent out in such a great hurry to his task that he had not prepared properly, which gave me the opportunity to act the benefactor. Soon he had a bed of old wool afghans and, when I discovered he did not mind raw potatoes, regular meals pilfered from Opa’s cellar. He accepted everything from me, even a name: I called him Wich. It was like Wichtel, with the same hiss of the German “ich”; I had heard my Opa use the word when speaking about fairies. The story was, as far as I could gather, that the tree had grown up from the seed of a certain fruit which was not supposed to be there, or anywhere for that matter. To taste it was forbidden. So Wich was there, guarding it. It comes from the orchard of the inner courts. “Where’s that? That way?” I pointed to where woods thickened. Being slow, I pointed another direction. They used to live here, he explained. Then they discovered the inner courts. Not that I know. They are very careful. Oh no. I am—what is the word? I am just one of their monsters. At once I protested on his behalf, but he insisted on the word, and indeed seemed offended by any other suggestion. Wich, I’ve said, was a very humble creature. I might have told Opa about Wich but for this. Indeed, I had been prepared to, the night I asked him about forbidden fruit. I had received a long talk on Adam and Eve, the Garden of the Hesperides and Ladon its hundred-headed guard-dragon, and various folk ballads like “Thomas the Rhymer”; but all at once he seemed startled by a notion and stared intently at me for a moment. I knew then that to allow those thick-browed German eyes to point that same gaze at Wich—Wich, who liked to be sat with each night when the light left and reassured it would come again—would be wrong. In deciding this, I decided a certain attitude towards Wich: I would not myself torment him for information about his home. Quite the opposite happened as a result: I provided him all he wanted to know about mine—and there was a lot. I explained politics and weather patterns and the Gregorian calendar and all sorts of things beyond my competence. Once, hearing my explanation of Opa and his scholarly work, he said, Ah, then their elders have very different aims than yours. After that he asked no more questions about Opa. His curiosity regarding myself, however, was undying, and when I began to show him my drawings he could not get enough. At the end of each day he asked to see my work, and would even make the occasional commissions—a sunset, a mushroom—which he would receive most ceremoniously on presentation. It was not all aesthetic delight, sure, for when I asked him what he liked so much about this or that picture, often his only comment was that it reminded him of home. But he was so enthusiastic that I was glad to oblige his interest. I will always remember one day in late July when Wich learned, to his astonishment, that not everyone drew, and I found myself in the position of expert explaining what an artist was—a position I did not mind in the least. Is it so difficult, even when you have fingers? He shook his head, flabbergasted. So long… How did you do it? The question brought me up short. It had always seemed to me that standing in front of a painting was the only place the world made sense. Our lives are lived in a series of images, and their unending succession has always suggested to me an incompleteness: why else would one follow upon another other than to make up for some lack or to improve upon what came before? Taken aesthetically, time is like an artist full of self-doubt and second-thoughts. A painting, however, is not so faithless. It takes a moment from the endless river, holds it up and calls it finished—and if it’s a good painting, and if we look hard enough, we can see it’s true. “I want to stop the trees losing their leaves,” I said finally, and Wich sighed and shook his head. I don’t think I shall ever understand time. That doesn’t matter back home, he’d said. He flicked his tail in a gesture I was learning meant something like an eye roll. Oh, no. We have something quite different. Obliging my frown, he continued. Here, things happen in order; back home, things happen in—in significance. He considered. We don’t have to go figuring things out like you do. What should happen next, what to become, I mean. Those things are done for us. We’re all too weak for it, even the masters. But then, we have… different problems. “But really, it’s not so hard,” I said, laughing at his gravity. No? He was looking at his feet, and I could tell there was something on his mind. He looked up then, almost sheepishly. The thing I can’t understand, he said, is how you make decisions. You say that you will paint and sketch every day of your life so that you become a very fine painter. But how do you know you really will? But how do you know you will make it happen? “That’s what a decision is—you say you will! You can’t decide on something that’s already been decided!” I threw up a stone and caught it, excited by my ability to make sense of the dilemma. But Wich still did not understand and shook his head in self-chastisement. “You’ll get it soon enough,” I said encouragingly. (4) Jägerlust. A common enough story is that of a village scenting an immense feast over the hills, one by one going out in search of it, and one by one getting lost in the woods—for when the Wichteln are at table, they always position themselves upwind. One also finds the idea hidden in the Grimm story, “Brüderchen und Schwesterchen”, where we read the curious lines: “When the roebuck heard the hunters outside, he said, ‘I cannot bear it, I must go out to them.’” This impulse is the Jägerlust (hunter-desire). It describes the creature who wants to be chased. I was glad of Wich’s company in the following months, for my Opa began to make trips to the surrounding towns, conducting his research, and I was left alone on the property for periods of up to three days (I never told my mother this: Opa and I had an understanding). On these occasions, we would make a small fire and look at the moon and talk about supermarkets, Van Gogh, and all manner of things—especially time. By mid August, however, the first blossoms appeared on the sapling, which was no longer a sapling but a tree as big as any in Opa’s orchard, and when this happened Wich began to behave oddly. It was like a hormone shift. At first he was only a little more jumpy than usual. But then as more blossoms emerged and the fruit itself began to grow, he began to move around more than he used to. He was like a dog locked in a room, hearing its master crying to it from without. He paced, he looked around at things that weren’t there, and he began to watch me from the corner of his eyes. One night, in the middle of a week-long stretch of insomnia (my sketching was going poorly), I arose, fed up with myself, and I trudged with my blanket down to the duck pond. I wondered if I might catch Wich at rest—for I had never once yet seen him asleep. As I drew near I saw a glow on the water. It could not have been the moon’s reflection, for there was no moon that night. I dropped into a crouch, as I had when I first seen Wich, and approached slowly. The thing—the being, entity, pick a word—was much taller than me, though when I saw it, it was stooped over Wich, stroking the fur behind his shoulders. It seemed to have candles burning in its chest. I thought immediately of what Wich had said: I am one of their monsters. I cannot do better than say it was like an angel, but not from heaven or hell—from some greener, earthier place. I had about five seconds to behold it. Then, responding to nothing I could perceive, it stepped away, and the night seemed to have lost half its stars. I wondered for a long time at this. When finally I came out of the brush and sat next to Wich, dropping a few potatoes before him and taking out some leftover sausages for my own midnight snack, it was all without speaking. We ate together. We chucked stones into the duck pond and counted ripples. We watched stars appear. The silence seemed an impossible thing to break. But then the silence became a different sort when I noticed something on the ground, and reached for it. It looked very much like an apple, though I knew at once it wasn’t. It was too dense; moreover, it was slightly oblong and roughly textured. And, like a living thing, it was warm. I wanted more than anything to take a bite; indeed, I thought of running off with it, bearing it to the privacy of my room where I could sink my teeth into it. I became aware of Wich’s eyes on me. Please, put it down, he said. Please, Lizze. They— He stopped. They were only checking on me. It was Wich’s turn to hesitate. He nodded. Wich’s silence was like a shrug. He only shook its head, as though the thought was incomprehensible. At first I thought he would not answer this either. Then, finally, he said in that same awed, sombre voice, It’s forbidden. For many moments I said nothing more, nor did Wich, and I knew the whole time that I held the fruit in my hand, and that Wich was waiting for me to drop it. He took the fruit immediately with his tail and placed it beneath himself as though it were an egg to incubate. I left him then, trembling all the way back home. (5) Gifts. It is a commonplace, in stories of Southern Baden-Württemberg, that any pie set to cool on a windowsill will go mysteriously missing, any child left to wander will be stolen, any books left on deckchairs will be gone by morning. Are the Wichteln thieves? Hardly. Among them is the concept of an un-given gift, or rather, a gift that can only be given by first being taken. This is the most counterintuitive aspect of our folk-entity: for it follows that offering such a gift looks a lot like forbidding it, and receiving such a gift looks a lot like stealing it, or at least breaking trust. It was this night that I was visited, for the first time, by the nightmare. I’ve had it many times since then. The altar cloth stirs gently as I walk through the doors, and then the place grows very quiet, very still. From behind the altar a head emerges. It is gaunt, shrunken, the hair is matted, and there is a diseased trembling running up from the spine to the eyes. There’s nothing evil about her; she doesn’t want to hurt me. But I am terrified, because I understand what has happened. Oh, it’s horrible. I have made her grow old. She begins to stand, weakly, supporting herself on the altar, but before she is fully arisen, before I can see her whole figure, I am—mercifully—awake. The dream came to me almost every following night. Perhaps it was my mounting anxiety: time was passing, and I had sketched nothing that I was especially proud of, nothing I felt sure of submitting to the competition. Like the leaves, one by one the days placidly released their grip. I helped Opa prepare large batches of kraut to trade at the market for winter supplies, I stumbled over German phrases, and I frustrated myself in front of the sketchpad. A second glance at my work revealed lines filled with hesitation, achieving nothing. By the time it was late October and my mother had arranged to pick me up and see the Pinakothek der Moderne in Munich before flying me back to Canada, I couldn’t believe I had accomplished so little. I did not mention my leaving to Wich, not until I had but two days on the farm. Opa was gone that night, so we made ourselves a fire to combat the chill air. Wich had begun to collect the windfalls in a great barrel I had rolled down from Opa’s tool-shed, and he sat atop it and flicked his tail listlessly against its side as I explained daylight-savings. You get a free hour? he said, puzzled. But where does it come from? “We insert it into the day, like this.” I lined up a few twigs, then found one more and slipped it in the line-up. So it comes from outside the day? I was glad he agreed. I had always loved October daylight-savings—it seemed to me as though all the gratuity of life were upon me in that one free hour, for it was outside scheduling and one could do anything with it: read a book, make cookies, go on a long walk… Of course, for all my excitement, that descending hour always seemed to be meant for something greater than I could give it. That was part of its charm. There is no shortcut through disappointing news. You’re leaving? he said, immediately rising on all fours and stiffening his tail. I nodded, and he began to pace. So soon, he said, as though shocked that time could have found another way to bewilder him. So soon. I was touched by the note of distress; in that moment I think I had a keener sense of what I would be leaving than in our goodbye, and a great sadness quivered up into my throat. All around, the twilight redoubled the oranges and reds of the leaves, and watching them fall here and there I felt myself at the center of a great flame burning upside down. At last Wich ceased his pacing and looked at me. I know what we should do with the hour. (6) The Fruit. This final concept is perhaps the most important—and most ambiguous. It is significant that when the Grimm brothers died with their most ambitious project, a definitive dictionary of the German language, incomplete, the last entry was Frucht (fruit). Most societies—the Greeks, the Peloponnesians, the Jews, the Native Americans, the old Teutons—have story of a forbidden fruit, and yet all differ as to why the fruit is forbidden. In Southern Baden-Württemberg, one hears stories of how the Wichteln live in a place a little closer to heaven than ours, how they grow there a tree with a sacred fruit, how the tree once stood in the first garden at the beginning of the world and was to have been part of humanity’s first diet—and how the Wichteln snuck in and claimed it for themselves, so that all our history we have been without our true fruit with God knows what consequences. I had wondered how Wich would deal with the fruit once the tree was bare. Did he expect to sit atop the barrel until they were all composted in two years’ time? He was naive enough to think it possible. To his credit, though, he had a much better idea. Opa was back, which made things difficult to shuttle the wheelbarrows of firewood to the duck pond secretly. It took many hours. Then, when I had diminished the wood stack as much as possible without alerting his suspicion, I took a hatchet and supplemented our pile with dried bracken. And finally, when the first stars came out, I dropped a match upon it. It flared, then fizzled, then grew steadily. When it was hot enough, Wich used his tail to fling the fruit into it one by one. He was in an agreeable mood that night; the anxiety of his duty, after all, diminished in tandem with the pile. Many times he asked, Is this the free hour, now? and many times I said, “No, not yet, it comes later.” Soon the barrel was empty and the fire was making funny noises, like lips flapping and sucking. We lounged peacefully, studying the flames and the shriveling fruit at their heart. The aroma came up in waves; it was rich and sweet, almost tropical, and made the edges of the nostrils tingle. Then he looked at me. So your mother arrives tomorrow? The one who does not ask to look at your sketches? This will be the first goodbye I’ve ever said. No. In fact, I’ve been considering what you said. About time. I think I’ve figured it out now, and I want to thank you. “Thank me?” I was surprised, and surprised even more by the curious conviction I saw in him; he stood like something hammered into the ground. It did seem an impossible thing at first, time. Too difficult for me, perhaps too difficult for anyone. But you’ve made it seem so simple, and I think I’ve realized. He paused. But you already know about decisions. When I first came here, there was an owl that lived in that old hemlock. His voice had become slow, calculated, a stick being forced into the mud. I used to make sounds at it, and sometimes it would make sounds back. But the crows never let the poor thing alone, and now it’s gone somewhere else. It rattled me. Other things too—toadstools growing up out of nothingness one day, eaten by deer the next. And then the leaves started falling, and I thought something terrible had gone wrong. Everything is so full of change here. I nodded. The fire gave a crack and gave me an excuse to look away from those intense eyes. Well, here I was thinking all this change was an awful distraction, something one gets confused by. But really, isn’t it all a great hint? A great clue? Because! You can never be sure what’ll last, so everything’s simplified for you, you just live, act, decide, how you think you should. I really did try to understand. But at last the pause became too long and I had to shake my head. “Doesn’t that just bring us back to square one?” I said. Wich cast his eyes down. Promise me something, he said finally. When you leave, don’t stop sketching. I almost laughed, only he had become so serious that I could not. Because, he continued, still looking away from me, because I really do like them. Because… Because—oh, you don’t need reasons, that’s just it! He looked at me for a long, uncomfortable time, and it gave me the feeling he had been trying to tell me something very different than his words. But then, for some reason, Wich started laughing. It did not seem incongruous with the mood, his laugh. It was like sticks knocking against each other rapidly, and after a moment I joined in, not knowing why; only once I was laughing did I see. Wich had, according to his alien sense of rhythm and timing, made the mistake said goodbye far in advance of our parting. Now we sat together, feeling parted yet not apart, ghosts in an in-between place. It was a cold night, for the ghost of winter haunted the air. I took a deep breath, feeling that by it I took a small leap through time into the dark months ahead—and all at once there was too much to look at. I felt unacquainted with the things around me, with the pulsing shadows and the knuckly soil and the colorlessly reflective water of the duck pond, and I kept thinking, I’m real, as though to reassure myself. When Wich began to talk, I followed his words in a trance. It is strange to burn the fruit like this, he said. When one is used to seeing them at the feasts, on silver platters. They say that at the feasts, they access the sixth, seventh, and twelfth senses. That they see the place where fires go when they are extinguished. That they sit in the place where the stars rest when the day comes, and make images with their laughter. “I’d like to make an image,” I said suddenly. 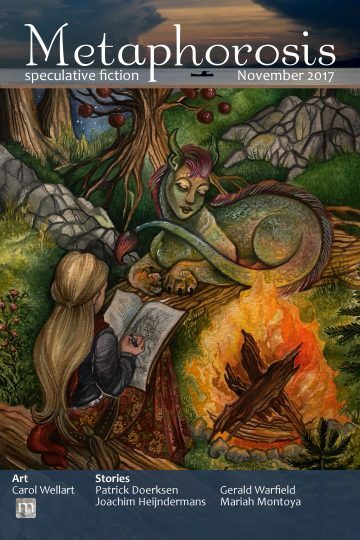 I took out some paper and began to draw Wich, curled up in himself with his tail by his chin, the fire beside him like a companion. I made every line with a perfect certainty of its meaning and had it finished within ten minutes. Then I promptly forgot about it. A feeling of euphoria had swelled up in me. I have long struggled to put the feeling to words, and the best I have is this: it was as though I was aware of the world not through my senses, but through my desire. My whole being had become like a mouth poised in hunger over an apple in the very moment before the down-bite, and life itself was the delicious thing. It was all too sudden. “Goodbye, Wich,” I said, hardly looking at him. The fumes had affected my sense of direction; it took me far longer than it should have to find my bed, and even there I had more finding to do—for though I knew I ought to be proud of myself for resisting the temptation, for responding with such clear-headedness as I did, I also felt that I had left something of myself behind. When at last sleep came, it came with the nightmare: I was walking towards a church where my sister waited for me, growing old. At some point without my knowing it, the clocked ticked past midnight and the free hour came to an end. I have summarized six aspects of the folk-entity under analysis. Conveniently, there is a story that combines all of these, told by a woman in Gengenbach. It goes like this: the Wichteln take a fondness to a certain young musician; therefore, they take his lute-guitar. He gives chase and comes to an orchard, where the Wichteln swear they will give back his lute-guitar if he only promises not eat of the fruit. The musician promises, and is allowed to stay with the Wichteln for three days. During this time he sees how, after feasting on the fruit, they are able to make far lovelier music than he has ever heard—so naturally he cannot resist, he eats. When he returns to the world, he is able to play any instrument he likes, and though thirty years have gone by and his family are all dead, this, he knows, is a small price to pay. And that, more or less, is the end of my story, at least so far as Wich is concerned. That morning, I awoke to the slamming of a car door and ran to the window: my mother was on the porch, emitting great dragon-like puffs of condensation into the October air. “I wish you’d not look so sad to see me,” she said. I never answered her, and we began to talk of all the sauerkraut I’d eaten and all the German I’d learned. She was in a hurry; half an hour later I was looking back down the long driveway from her rental car. I remember that last vision of the farm. It burned with the red fever of autumn, and I thought how the temperature would sink degree by degree when I was gone, how the sun would shorten its visits, how the leaves would continue to fall in staggering numbers. It felt, taken all together, like a great thing giving up. The months that followed were a strange, unreal time. I wept now and again tears that came out of black nowhere, and more than once I needed to leave class for the privacy of a bathroom stall. My mother told anyone who asked that I was processing their divorce, and perhaps that was it—they had, after all, surprised me with the news on my return to Canada, and I felt like an idiot for thinking the summer away had been about learning German. But time busied itself with its flattening, polishing work, and these teary episodes subsided. Eventually I stopped thinking about Wich at all. I might laugh, remembering something odd he’d said; or I might grow sad, thinking of that first night we had met and how there was no one now to bring him an umbrella when it rained (he had never figured out how to open one himself)—but that was the extent of it. Soon college was my whole life. I kept up my German and won all the scholarships that could be had for a student of Art History. I do not even remember thinking of Wich when I was deciding whether or not to continue painting. It came down to a simple choice, really: did I go on into graduate school, as all my professors, and my mother, thought I should; as I myself wanted? But I knew what that meant for my art. It took me two weeks to decide. In my heart I would summon the strength for the commitment, for those ten hour days in front of the canvas. But then, as though conviction itself were exhausting, it would fade, I would see just as clearly all the things I’d be giving up—professorship, esteem, contentment—for something uncertain, financially unfeasible, and so alien that I found myself having to defend to my lawyer parents and doctor relatives and politician friends every Christmas dinner, every thanksgiving weekend… And I would think—But I must! People may talk, my mother may fuss and frown, but all those voice are cant and I would be a fool to listen to them! And so on. How can I explain my choice? I had experienced the swell and puncture of certainty enough times that I found myself thinking: I may this moment understand what my future ought to be—but will I, in that future, understand this moment? Certainty counts for nothing if there is no way to package it for later. I entered graduate school. I became a professor. I did my art on weekends, and then not at all. Not surprisingly, considering the oblique nature of the gift, the above is one of the only instances in which the gift is received properly. More often the strangeness of the Wichteln’s cognition makes for a simple comedy of misunderstanding, and we find stories like that told in Dürmentingen, in which a group of Wichteln hope to share their delight in rule-breaking with a certain poor farmer and, accordingly, forbid him to milk his cows (he ceases), forbid him to bake bread (he ceases), forbid him to take a bath (he ceases)—forbid him so many things that he falls ill and dies. So different are the Wichteln from us that they seem almost unable to do us good, though they try—try so dearly to be chased, and to be found. Then, a few months ago, I received my Opa’s notes in the mail. It was strange timing, for I was at the height of my success: I had just published my second book the year before, received tenure that spring, and that very day had been asked to curate an exhibit of 17th-18th century German oil paintings for a New York gallery. When I arrived home and stood shaking the rain from my coat, I was thinking I might take my daughter out to celebrate. Then I heard her call from her room. I read the notes. I read the interviews. Then I read them again. “What’s wrong, Mom?” My daughter had come into the study and stood over me, one strand of hair loose, ticking back and forth. She’d taken out her ear buds. How could I explain what I felt? Since that day, my nightmare has begun to recur—only, changed slightly. I’ve begun to stay longer in the dream. The woman I’m walking to meet, the one I’d always thought was my sister—I see her stand fully, see her walk towards me, and see that there is another, far more obvious, reason for our likeness. And I watch, trembling, as she pulls paintbrush after paintbrush from the back of my own haggard, time-eaten face. It’s happened many times now. I wake, stand against the window pane to look out at the autumn night, and review my life: Have I been unhappy? Have I been discontent? Lonely?Insignificant? No. So why this nightmare? Is it so terrible, giving up one’s childhood dream? Millions do it. Millions walk around with the aborted foetus of a different future in their hearts. All have had such desires in their youth as would make them blush now. Why should mine hurt any more than theirs, and why should I feel so accused? And now there’s even my daughter—she’s begun to get up with me on these restless nights and linger in the moonlit hallway, asking me what’s wrong. And it’s true. Yet when she’s gone I turn to the window and wonder at the weight of autumn leaves in air, the windfalls of apples and pears upon the ground. Every tree seems to be the Wichteln’s tree, and the ground abundant with their fruit—and I can’t help thinking how differently I’d live if they were.